It is that time again. Time to polish up you presentation skills on your favorite language or technology features. The Chicago Code Camp is accepting proposals for presentations. Show everyone in the Chicago area what you know and submit your own. I really enjoyed presenting last year and just had to submit a proposal for this year. 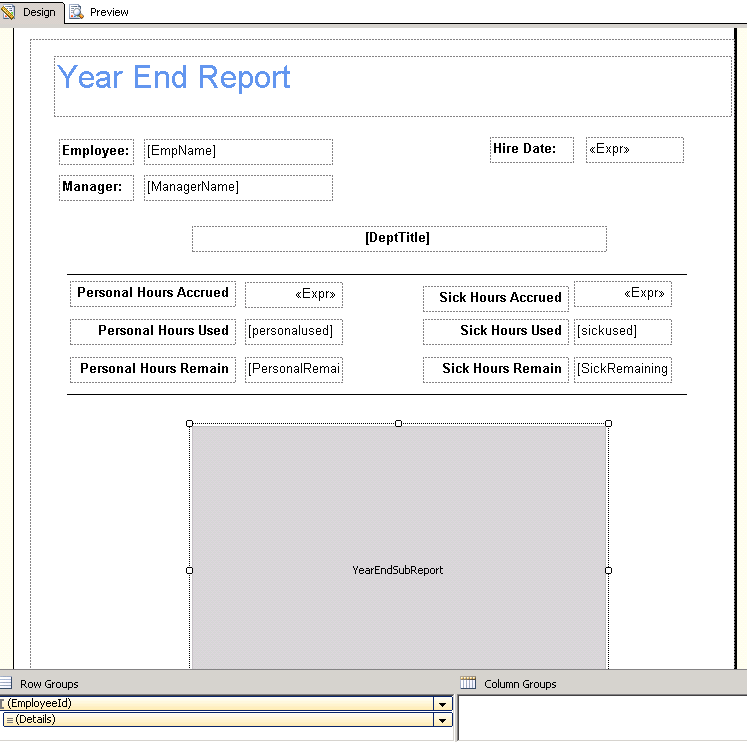 This time around my topic is Increasing Collaboration with Windows Phone 7, SharePoint 2010 and Office Open XML. I had a much longer title but the site forced me to shorten it up. I guess that is a good way to tell people not to get too wordy. If you don’t feel like presenting mark the date and come out and enjoy the company of your fellow geeks and learn about some new technologies. How did we get to March already? My how time flies when you are having fun. We had a spirited discussion on Enterprise Architecture at the February meeting. Well lets keep the fun rolling. The hottest technology right now is anything to do with mobile computing. We had an arm wrestling match to decide who was going to present on Mobile Architecture. Come see the winner (actually the guy who had time to put the presentation together) on March 15th at the Chicago Information Technology Architects meeting. You can register at the link below. If have a topic you would be interested in presenting at a future event please contact me through this blog. As I have been working on SQL Server Reporting Services reports the last couple of weeks I ran into a scenario where I needed to present a parent-child data layout. 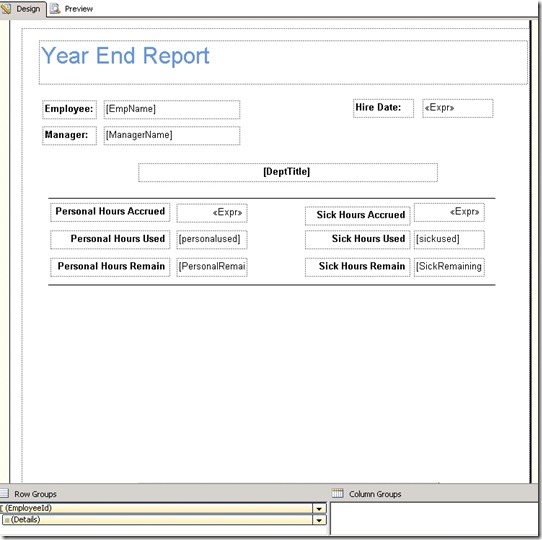 It is rare that I have seen a report that was a simple tabular or matrix format and this report continued that trend. I found that the processes for developing complex SSRS reports aren’t as commonly described as I would have thought. Below I will layout the process that I went through to create a solution. I started with a List control which will contain the layout of the master (parent) information. 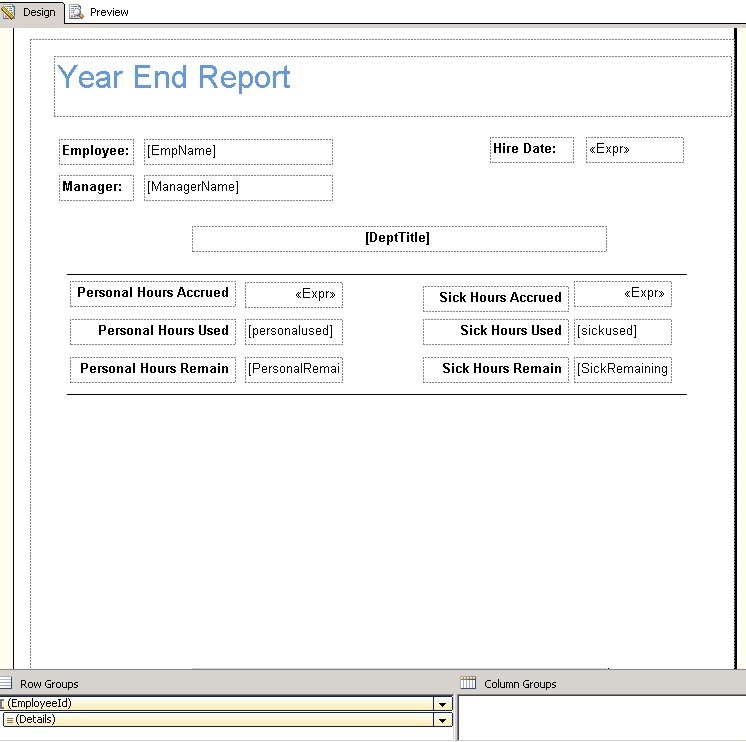 This allows for a main repeating report part. The dataset for this report should include the data elements needed to be passed to the subreport as parameters. As you can see the layout is simply text boxes that are bound to the dataset. The next step is to set a row group on the List row. When the dialog appears select the field that you wish to group your report by. A good example in this case would be the employee name or ID. 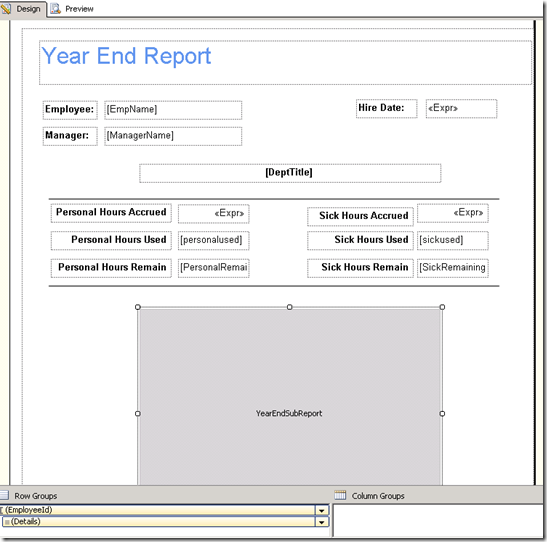 Create a second report which becomes the subreport. The example below has a matrix control. 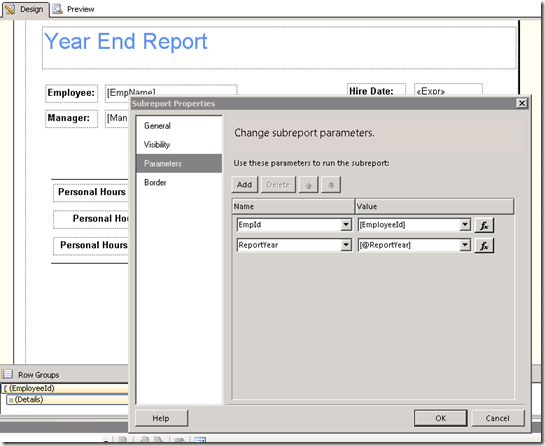 Create the report as you would any parameter driven document by parameterizing the dataset. Add the subreport to the main report inside the row of the List control. 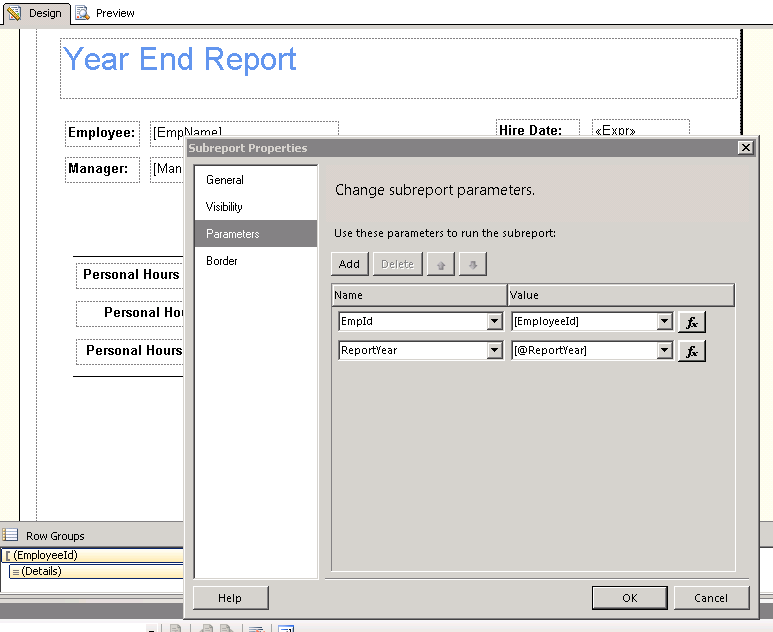 This can be accomplished by either dragging the report from the solution explorer or inserting a Subreport control and then setting the report name property. The last step is to set the parameters on the subreport. In this case the subreport has EmpId and ReportYear as parameters. While some of the documentation on this states that the dialog will automatically detect the child parameters, but this has not been my experience. You must make sure that the names match exactly. Tie the name of the parameter to either a field in the dataset or a parameter of the parent report.